What is the perimeter of an equilateral triangle with an area of ? Notice that the small triangles within the larger triangle are both triangles. Therefore, you can create a ratio to help you find . Finally, take the square root of both sides. This gives you . Therefore, the perimeter is . An equilateral triangle with a perimeter of has sides with what length? An equilateral triangle has 3 equal length sides. So divide the perimeter by 3 to find the length of each side. Jill has an equilateral triangular garden with a base of and one leg with a length of , what is the perimeter? Since the triangle is equilateral, the base and the legs are equal, so the first step is to set the two equations equal to each other. Start with , add to both sides giving you . Subtract from both sides, leaving . Finally divide both sides by , so you're left with . Plug back in for into either of the equations so that you get a side length of . To find the perimeter, multiply the side length , by , giving you . Find the perimeter of an equilateral triangle whose side length is . Find the perimeter of an equilateral triangle given side length of 2. What is the height of an equilateral triangle with a side length of 8 in? An equilateral triangle has three congruent sides, and is also an equiangular triangle with three congruent angles that each meansure 60 degrees. 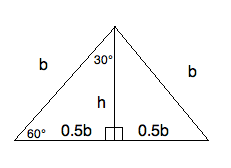 To find the height we divide the triangle into two special 30 - 60 - 90 right triangles by drawing a line from one corner to the center of the opposite side. This segment will be the height, and will be opposite from one of the 60 degree angles and adjacent to a 30 degree angle. The special right triangle gives side ratios of , , and . The hypoteneuse, the side opposite the 90 degree angle, is the full length of one side of the triangle and is equal to . Using this information, we can find the lengths of each side fo the special triangle. The side with length will be the height (opposite the 60 degree angle). The height is inches. 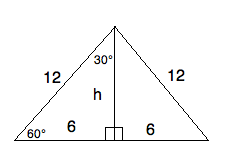 Find the height of a triangle if all sides have a length of . What is the height of an equilateral triangle with sides of length ? The ratio of to is the same as the ratio of to . The Triangle Perpendicular Bisector Theorem states that the perpendicular bisector of an equilateral triangle is also the triangle's height. is an equilateral triangle with side length inches. What is the height of ? To calculate the height of an equilateral triangle, first draw a perpendicular bisector for the triangle. By definition, this splits the opposite side from the vertex of the bisector in two, resulting in two line segments of length inches. Since it is perpendicular, we also know the angle of intersection is . So, the height of our triangle is .